I’ve been reading the Adam and Andy comic for years and years – before they invented RSS, or so it feels. It’s rarely laugh-out-loud stuff, but it’s sweet and life-affirming all the same. And sometimes, it’s uncannily like they’re actually spying on us. And just clicking through the archives finds many situations that just well, click. And this one. 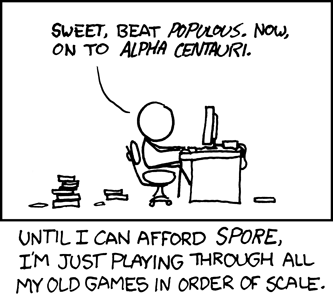 By talking about Alpha Centauri, it reminded me about Civilization, which I have spent days of my life playing, and enjoying. So, I fired up Amazon, realised Spore was was quite affordable and clicked the ONE-CLICK-OF-DOOM and thanks to Amazon’s amazing efficiency, the new game arrived in the post the following day. I have now spent about 20 hours playing it, including one massive 9-hour stretch where time escaped me a bit. Thing is, I don’t actually like it that much. It’s not a patch on Civilization IV which I still love to play, when and if I can find the disc. And yet… it definitely has a strong urge that keeps you playing. I haven’t beaten the Space age yet, but I have fairly easily defeated all the other bits. Largely because it’s one of those games which a boon to people like me who are crap at computer games – if you die, there are no, or few consequences. You just start again where you left off. It’s ever so easy to play. Like Civ, you get a huge manual, and like Civ, you can play it without ever needing to open the book. But its real huge thing is all the user generated content. Presumably you could play forever without really coming across the same creature twice, because it can connect to the internet and download creatures made up by thousands of other users. The Spore.com website says 939,307 new creatures were added in the last 24 hours. Wow. Anyway, I have all these missions I have to complete in and around space. I’ll see you in, ooh, a few days…? I was seduced by the blaze of publicity for Google Chrome, and for some reason, I’ve carried on using it. It crashes less often than Firefox, and I do like some of the features. Like, if you open a new tab from an existing tab, it places that one next to the one you’re using rather than at the end. I like the “these are the websites you use most often.” It feels very slightly better than Firefox, so I haven’t gone back. What I miss, however, is manifold. I miss all the plugins for starters – no more little weather icons at the bottom corner. No little thingie telling me which of my google accounts needs my attention, and then helpfully logging me into the wrong one. No little thingie telling me about new tweets, so now I actually have to the check the twitter website, off my own bat, to see what’s going on. But what I miss most of all is the thingie that blocks ads appearing. Clearly I use it wisely – libdemvoice.org is entirely ad-funded, for example, so I turn it off for that. But for most sites, I had the thing on full throttle, and was rarely vexed by advertising. Google Chrome has advertising aplenty – and why would they change it, when they make so much money from ads themselves? Now I am Chroming most of the time, I see all the ads again. And they know me too well. Quite apart from endlessly showing me the LibDemVoice google ad I placed myself, Facebook is full of bright-toothed tanned hotties exhorting me to go on a gay cruise. And every recipe site I look at is full of diet pill ads, and steps to a flatter stomach. Oi, fat gay! Eat these pills, get on this boat. Bah. Enough!